Ideal for the average group outing. 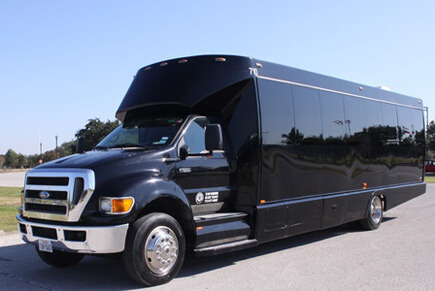 Our rugged F-650 black party bus is a wonderful choice for any occasion and offers you and your guests with a most spacious place to have a good time. This beauty is equipped with a cool black interior, color changing lights, and we guarantee that you will love the VIP feel before we even hit the road together! 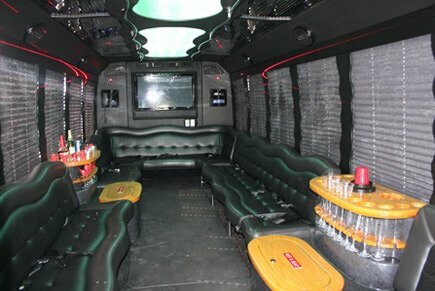 This unbelievably cool vehicle features several bars with ice-filled coolers, so be sure to bring your drinks aboard. While you're on your adventure, don't forget to plug in your tunes and fire up our incredible audio system! You'll be rocking and rolling the night away within no time!